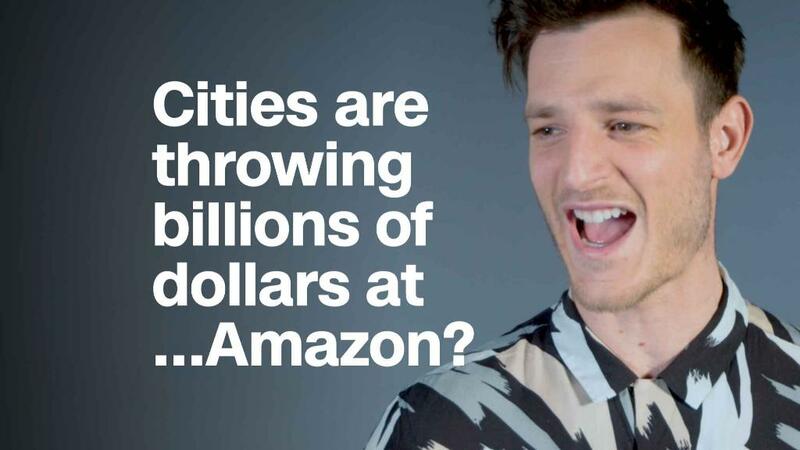 Cities are throwing billions of dollars at...Amazon? Fifty thousand well-paid jobs, a $5 billion investment, winning the affection of perhaps America's most dynamic and fast-growing company: Why wouldn't a city go all out to win Amazon's second headquarters? A few reasons, actually. And as a fight over taxes in Amazon's home city of Seattle comes to a head, some of the contenders are starting to worry about the potential side effects that could come with it. The dispute in Seattle has arisen from the rapid escalation in housing prices and a resulting surge in homelessness, due in no small part to the influx of highly paid workers employed by Amazon and other area tech companies. To help alleviate its shortage of affordable housing, several city council members proposed a 26-cent tax for each working hour at companies with more than $20 million in annual revenue — the largest impact of which would fall on Amazon, with its 45,000 local employees. Amazon took exception to the proposal, saying that it would pause construction planning on a new skyscraper downtown and might sublease space in another that's already being built. Although Amazon has taken some steps to help ease the city's homelessness problem, such as donating space to shelter 200 homeless people in one of its new buildings and additional $40 million to a city-managed fund for affordable housing, the measure's backers took Amazon's move as an ominous sign. "Obviously Amazon can afford to pay the 26 cents," says Seattle Councilmember Mike O'Brien, who supports the tax. "It's really a question of, do they feel loved? And they're offended. They're like, 'you don't recognize all the good stuff we do in the community and we get blamed for all the bad stuff. We want to go somewhere that's more generous to us, and we're pissed.'" The council members' vote on the tax is scheduled for Monday. Now, Amazon's resistance has others wondering how the company could help blunt a Seattle-style affordability problem in the city it chooses for its HQ2 — or whether it would. In the shortlisted city of Dallas, for example, a 50,000-person outpost would make Amazon by far the city's largest private-sector employer. The metro area is already expanding fast, having added 86,000 jobs in 2017, led by the energy and financial services industries. 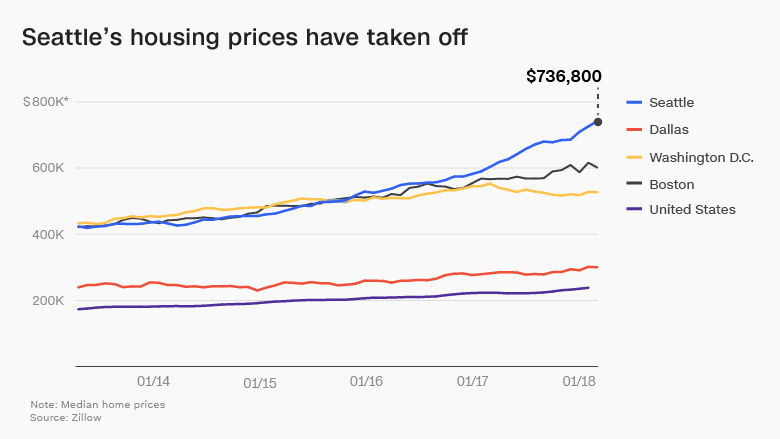 Housing prices have already been escalating rapidly, as builders struggle to keep up with a hot job market, and city council member Phil Kingston worries that pouring on more growth without proper planning could make life difficult for current residents. "It is entirely possible to have booming economic development that fundamentally doesn't benefit its host city," Kingston says. To head off an even worse housing crunch, Kingston would like to see Amazon build a campus with space for both retail and housing, and invest its own money in affordable housing in other parts of the city. The company has been meeting with nonprofits in its potential HQ2 host cities to discuss how it could help avoid displacing longtime residents. However, the spat in Seattle makes Kingston worry about Amazon's willingness to play cities off one another in order to avoid taking responsibility for the consequences of its rapid growth in the future. "If you sleep with someone who's cheating on a spouse," Kingston jokes, "you already know for a fact that person is capable of cheating." Cities do have many tools at their disposal to cushion the impact of an influx of high-income newcomers on lower-income residents. Barry Bluestone, a professor specializing in urban economic development at Northeastern University in Boston, cautions against imposing per-employee taxes, like Seattle is proposing. Instead, he says, cities should rely on personal income and property taxes, which are less likely to repel businesses or keep them from growing. "Seattle and Boston share a lot in common because we've been able to take advantage of new industries," Bluestone says. "The downside is, if you don't build more housing, prices go through the roof. The answer is not to constrain demand, but increase the supply of housing." In Boston, another Amazon HQ2 contender, Bluestone is pitching high-density developments aimed at millennials and empty-nesters who are downsizing. Large employers and educational institutions, he says, would then jointly hold the master lease to these buildings with the developers and sublease the units to employees or students. Absorbing those newer residents into apartment or condo buildings could take the pressure off the city's older housing stock that's more suitable for families. That type of development would be easier in many cities — particularly places like San Francisco and Washington D.C. — if they eased zoning restrictions on building height, unit size, and parking. But still, building low-income housing may never be profitable without subsidies, and extra tax revenue to finance it can be hard to find. Many cities, including Seattle and HQ2 hopefuls Dallas, Austin and Miami, are forbidden by state law from imposing any income taxes. Others have capped property or sales taxes. That's why some groups have taken the position that their cities shouldn't be pursuing Amazon at all, whether it asks for tax breaks or not. Monica Kamen, co-director of the 60-organization Fair Budget Coalition in Washington, D.C., thinks the city should prioritize smaller businesses and community-based entrepreneurship instead. "The kind of development we're hoping to see is hyper-local, looking at the folks who need jobs most in our community," Kamen says. "We don't really need more giant corporations coming here to jump-start economic development." The hesitance among some to welcome Amazon comes from a recognition that for cities, growth is not an absolute win. It comes with challenges that, if not met, can decrease the quality of life for those who live there. That's why some backers of the Seattle measure say it might not be a bad thing if Amazon sent some of its jobs elsewhere, as it's already been doing. To Mike O'Brien, Seattle could slow down a bit and still have an incredibly healthy economy — maybe even one that allows other businesses to grow faster, if Amazon weren't sucking up all the available tech talent and downtown office space. But he has one warning for Amazon's prospective new hometowns: Don't wait until homeless encampments crowd the underpasses before doing something about housing. "When they start growing at thousands of jobs a month, it's too late," O'Brien says. "So you need to tell Amazon, we need to know exactly what you're going to do, and we need a commitment up front."